Passionate Professionals; Craig, Vanessa and their crew at Urban Escape are committed and passionate professionals in every sense. They not only produce amazing end results but even before you’re in their extraordinarily capable hands you can rest assured that they are 100% in the know and ready to work with you as an individual. I’ve been a client of Craig’s for close to 8 years and have recommended numerous friends to him, with close to all now being regular clients too (those who aren’t are either now interstate or in another country!). Curly hair might be admired from afar and longed for by those who don’t have it, but those who do understand the battle to find the right product and a hairdresser who genuinely knows how to work with it. I struggled with my hair for years. It wasn’t until I tried Aveda, and not longer after stumbled across Craig Withers, that I came to appreciate my afro locks. Now I embrace my hair and even strangers approach me to compliment my curls. Over seven years I followed Craig through half a dozen salons but none have compared with Urban Escape. The salon is not just a beautiful space to cut hair; it is carefully structured to ensure the comfort of every client to the tiniest detail. Aveda’s pure and positive message is reflected in the professional attitudes of Craig, Vanessa and the rest of the Urban Escape team. Their passionate commitment to the art of hair and their dedication to the individual is evident in the loyalty of their long-standing clients are the reasons their success will only continue to flourish. Congratulations to Craig and the team for creating Urban Escape! It draws on the best from all the salons Craig has worked in and managed, combined with his strong design vision and personal warmth. I’ve been a client of Craig’s for eleven years, starting at Harvey Nichols in London, and at Urban Escape Craig has created a salon that fully complements his personality and technical excellence. Life is hectic. Take a breath. ‘Escape’We can get caught up in what seems like the never-ending routine of our busy lives and sometimes forget about how important it is to take a step back, draw a breath and relax. There is truth in the name ‘Urban Escape’ – the instant you walk into the salon, the pressures of everyday life melt away and you are swept away to a place of relaxation, beauty and escape. The team at Urban Escape are highly skilled professionals who are committed to their work and passionate about each customer. The team are fantastic and make you feel welcome from the moment you enter through to the time you leave feeling revitalised and uplifted. 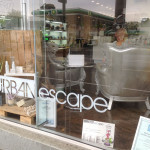 “I am always delighted at the service and skills of each team member at Urban Escape. After each appointment, I walk out with a spring in my step, ready to take on the world with new-found confidence.” With the life we live today, it is important to make time and treat yourself to a relaxing and enjoyable experience. Urban Escape is not just a salon, it is an experience – you walk out feeling revitalised and energised. They think I spend ages on my hair but it is seriously the way it is cut. Craig is smart, good fun and customer focused …P.S so are the rest of the team! Normally when I have been to new hairdressers I walk out the door saying to myself ‘Well I won’t be going back there again.’ Needless to say I’ve been to many hairdressers and hated my hair every time. The class I have been wanting all my life! Now I know how to blow dry my hair properly with my much needed volume. Hair up with 6 pins will take practice but now I know the technique as well as how to curl with any various tools. Big thanks to Craig for making us more beautiful. Thank you Craig, for a truly helpful evening, sharing styling tips and tricks. Everything was explained in simple, easy to follow steps – can’t wait to try what I’ve learnt at home! The blow-drying course was great. I realized I was using the wrong brushes hence I struggled to get my hair as smooth and shiny. Great tips for styling – easy to use and learn. Craig was very informative and precise with the demonstration to ensure it was very clear and simple I felt confident to use their techniques at home and would recommend this class to anyone.